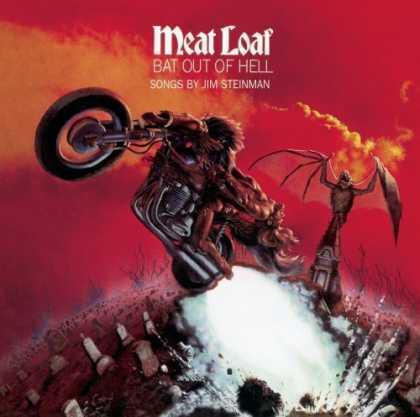 "I won't marry a woman who doesn't like Meat Loaf." Sometimes, it's nice to take time off and do absolutely nothing. And a rainy day in Canberra is the perfect time and place to do it. Although I have since heard the country's capital city is the adult bookstore capital of Australia, you couldn't prove it by me. Because the weather was overcast when I arrived, the hostel so far from town and there was such good conversation to be had, I saw no reason to go into town. Instead, I spent the most of the weekend with fellow backpackers, talking about subjects ranging from how thunderstorms seem to cause fatigue and how people come up with ideas for David Letterman's Stupid Human Tricks to sports and the rock star known as Meatloaf. The story also prompted him to remember the tale of a friend who insisted he couldn't marry a woman who wasn't a Meatloaf fan, and how the friend's love of the singer got him into a misunderstanding at work. It had all started when he heard a black woman in the next cubicle say she liked Meatloaf. The next day the friend struck up a conversation with the woman saying, "So, you like Meatloaf..." The comment prompted a grunt but no further comment until later in the day when he asked her which song she liked best. As it turns out, she was talking about ground beef's amorphous answer to SPAM, not the singer. Which just goes to show it's hard to speak and not be vague. I finally caught a bus into town the next day and visited the National Film and Sound Archive and the National Gallery. Although I'm a film buff, I can't say I found the movie museum all that impressive -- it spent far more time focusing on how radio and film technology came to Australia than it did covering the shows themselves. To judge from the headphones the museum gave visitors to hear a pre-recorded tour, the country may not have perfected the technology yet: some headsets didn't work, and the ones that did went out of range of the recording any time I rounded a corner. I would have enjoyed the art museum more if I liked aboriginal art, but I quickly learned I didn't. I can't explain why, I just don't. But, then again, I don't particularly enjoy lifeless paintings of fat, pompous-looking, overfed white guys either. About the only paintings that caught my attention depicted the life and times of Ned Kelly, which there are an over-abundance of in Australia. Kelly is a folk hero cut from the same cloth as Jesse James and Billy the Kid. Born to an alcoholic rustler father and a mother who sold illicit liquor in 1855, he not-too-surprisingly turned to a life of crime as the head of a gang of notorious no-goodniks after some rather unfortunate brushes with the law -- including the arrest of his mother. When he was finally brought to justice and hung Nov. 11, 1880 his last words were, "Such is life." For this, Australians love him. The country's worship of this man puzzled to me but, after having just tasted Vegemite that morning I wasn't about to question Australian tastes. Having seen enough of what passes for art in Canberra, I stopped at a tobacco store to buy a ticket for the bus back to the hostel, then tried to give the ticket to the driver as I boarded, but he wouldn't take it. I didn’t have the wrong fare, though. It turns out he was on strike. All transit workers were. It was the strangest strike I'd ever heard of. Instead of skipping work and walking picket lines, the drivers were doing their jobs but hitting their company where it hurts-- by refusing to collect fares. Why can't all strikes be like that?